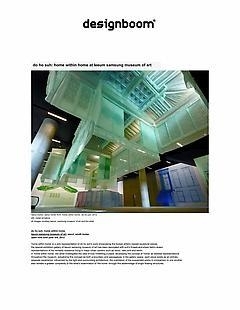 'Home Within Home' is a solo representation of Do Ho Suh's work showcasing the Korean artist's newest sculptural pieces. The special exhibition gallery of Leeum Samsung Museum of Art has been decorated with Suh's thread-and-sheer-fabric-drawn representations of his nomadic existence living in major urban centers such as Seoul, New York and Berlin. In 'Home Within Home', the artist investigates the idea of truly inhabiting a place, developing the concept of 'home' as skeletal representations throughout the museum, actualizing this concept as both a boundary and passageway in the gallery space. each piece exists as an entirely separate experience, influenced by the light and surrounding architecture; the orientation of the suspended works in comparison to one another also reveals a greater complexity to the artist's examination of 'the home' through this assemblage of bright floating structures.